When I think of author events, I imagine an author reading in a bookstore — many bookstores — as part of a grand tour. I’ve attended these events for big-name authors, and I figure if they do it to promote their books, it’s got to be a good idea, right? I learned something important on my book tour from Gig Harbor, Washington, to South Pasadena, California: The people who show up to your event are pretty much the people you pulled in. The bookstore itself doesn’t pull in a lot of people who didn’t already know and love you. Even for the big-name authors, audiences consist of people who already know their work. That said, author events help build buzz, and they can be a lot of fun. And if you’re good at sales, they can help with that. Just remember, you will need to do whatever is required to draw in an audience. It’s best to read in places where you have a big group of friends or family, or where you know there’s a good-sized group of people who are interested in your topic. Promote your event several weeks ahead of time, so people can get it onto their calendars. Reading at bookstores: The go-to option. Readings at non-bookstore venues: Sometimes an even better option, depending on the subject of your book. Blog tours: Guest posts (written by you) and book reviews (written by bloggers) on targeted blogs can get your book in front of the appropriate audience. Post a lot of them during the same week, and you have yourself a “blog tour.” There are plenty of services that will set up and manage a blog tour for you; do a web search for more info. In the interest of fair and balanced reporting, here’s a March, 2013, Huffington Post article by author Lev Raphael, whose blog tour sounds like it was a waste of time. Book fairs: The Library of Congress lists book fairs by state, and BookFairs.com says it has the “most complete and authoritative listing of book, paper, and ephemera fairs and auctions on the Internet.” At book fairs, the name of the game is attracting people to your table. Scott Scheller was very successful at pulling people in with word of mouth at the Central Coast Writers Conference: Visitors told each other about the cute mini-typewriter display (provided by Scott’s wife) that held his business cards, and the tasty cookies he was handing out for free (purchased from Costco, and nicely presented with Scott’s business card attached to the cellophane packaging). I know this works, because I sat next to Scott and watched in awe as more and more people came by for the cookies. 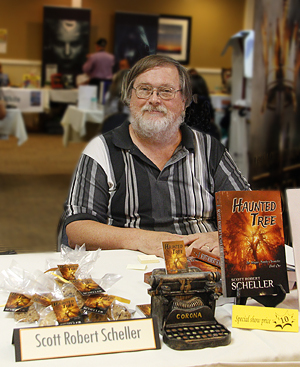 Conferences: If you’re speaking at a conference, be sure to bring your books along to sell. This works best if the book is related to what you’re speaking about, but you can even sell books if you’re speaking on another topic. Next up: Book your venues. Back to Start now. Back to Set up pre-launch communications.